One of the best hostels I've stayed in! Staff are so lovely, gave us maps and recommendations and showed us all around the hostel. Great rooms - really clean, comfortable beds and big rooms. Amazing bathrooms for a hostel really clean, nice big showers. The whole hostel was so clean and nicely decorated, nice farmhouse feel. Really great place to stay. It is a lovely place thank to the staff and one lovely lady Dee who makes this place special too! I have stayed there for a week or so and have to say I had an amazing experience of how lovely can people be to each other. The place is always very clean thank to wonderful ladies (you know who you are) and the guys too try their best :) The showers are extremely good, the value for money is great! I want to say thank you to all of you who made my stay such a nice warm experience!!! Hugs to all!!! 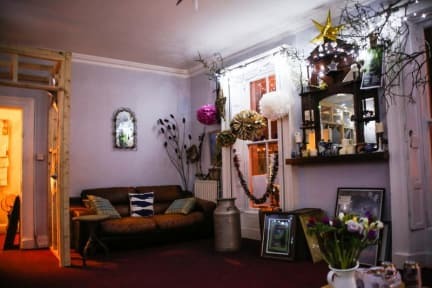 Great hostel in prime location to this small town/city.Bus /train station close by.Easy walking distance to both.Hostel has awesome toilet and showers,The layout is different however nothing to complain about.The owner has a vision to expand so when he does this could be a top rating hostel Would stay again. Very friendly and helpful staff, hostel within walkin distance to town centre (5 min.) , amazing showers :-) We stayed in shared mixed bedroom for 8 people, we felt safe, the atmosphere was quiet (which was good), maybe because it was already off season. For one or two day stay it's fine. There is lovely small courtyard/smoking place, which must be great in the summer. Breakfast consisted of variety of cereals, fruit, juices, homemade jams and pastry + variety of teas = yummy.